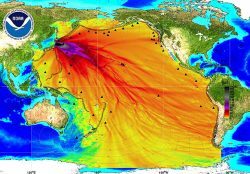 Sunday, March 11, marked the seventh anniversary of the Japanese earthquake and tsunami — seven years for a group of US Navy sailors to get sick and some to die as a result of their exposure to radiation coming from the Fukushima Daichi nuclear plant that was devastated by the tsunami. They were part of a rescue mission to that plant in the days following the tsunami. Journalist Gregg Levine has written an investigative piece for the Nation Magazine titled “7 Years on, Sailors Exposed to Fukushima Radiation Seek Their Day in Court.” Writer’s Voice host Francesca Rheannon spoke with Levine on March 12, 2018.